Place three of your favorite hanging items in one convenient viewing spot using this Erva Black Five Piece Pole Kit with Extended Arms. The generous size, robust steel construction, and classic design of this kit create an ideal way to display hanging items in a yard where space is limited. The three sections of the 1" diameter, tubular steel pole attach together easily with swaged ends, and an included, 26" long auger keeps it stable in the soil. The pole base slides into this socket perfectly, secured by a large bolt. Three, 22.5" long arms slide into a sleeve on the top section of the pole, and a finial here adds a finished look to the station. An upward curl completes each arm, and the fantastic length of each supports a bird feeder or flower basket up to 39" in diameter. The powder coated, black finish throughout the piece protects it from exposure to the elements while perfectly enhancing your hanging items. 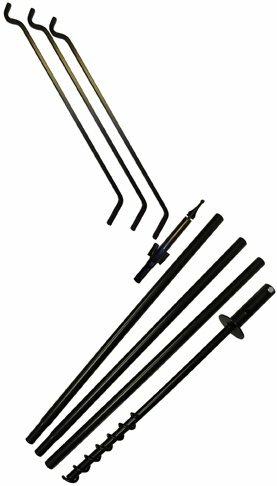 Increase the display area of your backyard with this Black Five Piece Pole Kit with Extended Arms. Assembly required. Made in the USA. If you have any questions about this product by Erva Tool & Die, contact us by completing and submitting the form below. If you are looking for a specif part number, please include it with your message. Set of 2 Premium Window Bird Feeders for Wild Birds - Outdoor Use Only - 7.5 x 5.9 x 4.1 - Holds One Pound of Birdseed! © 2019 - mirrorproject.org. All Rights Reserved.